The Finningham Local History Circle was formed a few years ago by a group of enthusiasts to research the history of the village and surrounding areas. Normally, the Circle meets once a month in The White Horse to discuss matters of interest or listen to a visitinig speaker. 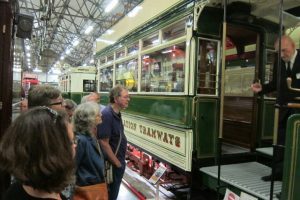 Occasionally, trips to places of interest are organised, the latest of which was to the Transport Museum in Ipswich. Twelve members of the Circle made the journey and spent a very interesting afternoon on a specially arranged guided tour of the museum. All the exibits have an association to the town, either by being manufactured there or used by the Town at one time or another. The star exhibit was a tramcar which had taken 15 years to rebuild and is now in immaculate condition. Sitting on the open top deck, one could imagine the conditions our forbears had to endure when travelling around the town. Those of you who have visited our old website, before it was hacked, will know that we have had a large number of enquiries by people who are researching the family trees and have a connection with the village. The FLHC have been able to help most of these requests for help, either from their own research or from other documents which are available. It is a great pity that, due to the hacking of the previous site, all the previous queries and answers have been lost but, hopefully, this work can be renewed. If you have any outstanding requests for information, please repeat your enquiry, so that it can be researched and answered. We have received a photograph of Edward William Selsby (see below). We was a victim of the WW1 carnage and is commemorated on our village War Memorial. I have just come across your website. I am the granddaughter of Edward William Selsby and the photograph you have of him does not match the one I have and believe to be him. I would be interested to know the source of the photograph. We have done quite a bit of research about grandad but, as he never spoken about by my grandmother, we know little and have very confusing stories from websites. My mother was 3 months old when he was killed. I shall check with the Local History Group and let you know. Thank you for your information. 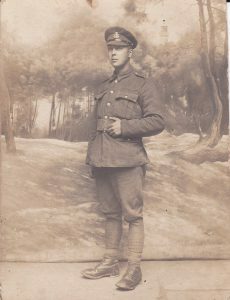 As the photo was sent to you by my cousin it would seem to be of Edward Selsby, my grandfather. I am now left wondering as to the identity of the soldier I have . I am currently researching a project around the Roll of Honour and have done some work on the Selby family. I have used the photo shown but don’t know its source. I would like to share information if that’s possible. Hi Jane. Do you think this might be Harold Selsby? The cap badge looks more like the Cyclist Corps (Harold) than the Border Regiment (Edward) but it’s hard to say.